The world faces multiple challenges to food security including undernutrition and overconsumption, rising food prices, population growth, rapid diet transitions, threats to agricultural production, inefficient production practices and supply chains, and declining investment in food system research. In addition to causing widespread human suffering, food insecurity contributes to degradation and depletion of natural resources, migration to urban areas and across borders, and political and economic instability. Food insecurity afflicts communities throughout the world, wherever poverty inhibits purchasing power and prevents assured access to food supplies. Global food prices have risen dramatically in the last few years and are forecast to rise further and become more volatile [1, 2], disrupting assumptions that stable or declining food prices and assured supplies can be taken for granted. The estimated number of hungry people in the world rose from 800 million to over 1 billion following the 2007/08 food price spike a. It is estimated that an additional 44 million people have since fallen into extreme poverty due to the rise in food prices since June 2010 . Globally, diets are shifting towards higher consumption of calories, fats and animal products . A growing number of low-income and middle-income countries are facing a double burden of malnutrition: a persistence of both macronutrient and micronutrient undernutrition, notably among children, along with a quick rise in the number of overweight and obese people, and diet-related chronic diseases [6, 7]. The food system faces additional pressure as the global population grows to around 9 billion by 2050 . This dramatic increase in global population will be accompanied by major shifts in the regional distribution of our planet’s inhabitants. From 2010 to 2050, the population in Asia is estimated to grow from 4.2 billion to 5.1 billion and Africa’s population to grow from 1 billion to 2.2 billion . From 1950 to 2050, the population ratio for developing countries to developed countries is projected to shift from 2:1 to 6:1 . As the world population has grown, the land available per capita has shrunk from 13.5 ha/person in 1950 to 3.2 ha/person in 2005, and is projected to diminish to 1.5 ha/person in 2050 . Agriculture continues to be the economic mainstay of most low-income countries, employing the majority of the population in these countries. The importance of agricultural research and development for food security and poverty reduction has been recognizedb, yet recent decades have seen declining investment from both donor partners and low-income country governments [1, 6]. In low-income countries with agriculture-based economies, domestic public support to agriculture is, on average, about 4% of the gross domestic product, and official development assistance provides the balance [6, 10]. At the beginning of the 21st century, only 6% of total spending on agriculture research and development in low-income countries came from private companies . In the coming decades, climate change and extreme weather events will exacerbate the fragility of food production systems and the natural resource base, especially in places affected by soil degradation, water stress or desertification . While the overall effect on agriculture will vary among geographic regions, it will be harder for farmers to plan and manage production and prevent crop losses from storms or pests wherever planting seasons and weather patterns change. Already heightened by globalization, a warming climate is likely to increase the incidence and geographic spread of human, animal and plant diseases [1, 12, 13]. While no legally binding agreement was reached at the United Nations Framework Convention on Climate Change (UNFCCC) 15th Conference of the Parties in 2009, the Copenhagen Accord provided a commitment to hold the increase in global temperatures below 2°C. Over 70 countries submitted emissions reduction targets under the Copenhagen Accord, and more formal UNFCCC agreement on the 2°C limit was achieved at the 16th Conference of the Parties in Cancun in 2010. The 17th Conference of the Parties produced the Durban Platform for Enhanced Action, which commits parties to reach a legal framework for reducing global emissions by 2015 . Despite the agreed 2°C target, greenhouse gas emissions are still rising. Even a 2°C rise is predicted to be problematic owing to increased floods and storms, a shortage of water resources, impacts on food production at low latitudes, greater depth of seasonal permafrost thaw and other changes. Yet greater change in global temperature would be disastrous. A 4°C change in average global temperature (estimated by the Intergovernmental Panel on Climate Change’s A1F1 scenario for the end of this century ) is predicted to bring about a much greater temperature increase in the Arctic, a substantial impact on major crops in all regions, around 1 billion additional people experiencing water scarcity by 2080, extensive coastal flooding as sea levels rise and other negative impacts  (Figure 1). 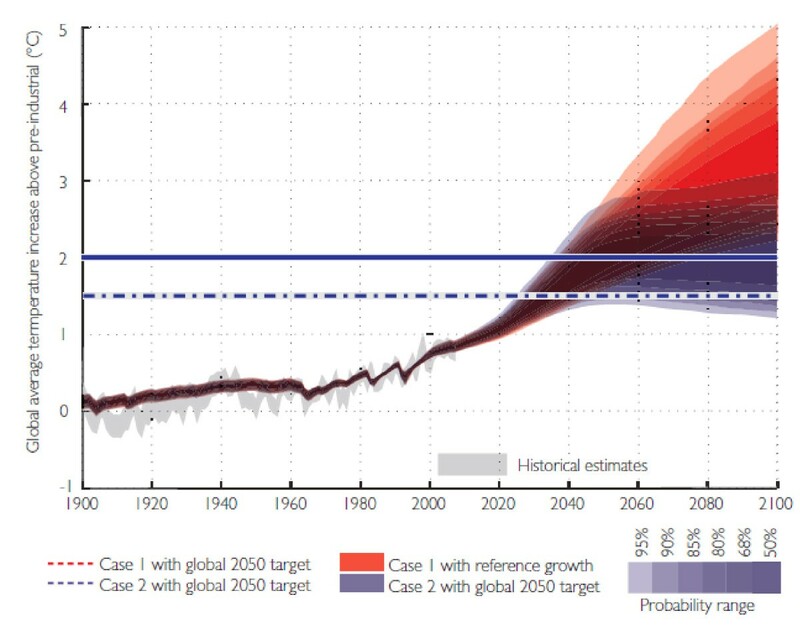 Effects of the Copenhagen Accord on global average temperature through the 21 stcentury . Agriculture consumes 70% of total global ‘blue water’ withdrawals from available rivers and aquifers, and will increasingly compete for water with pressures from industry, domestic use and the need to maintain environmental flows . Current farming practices, including land clearing and inefficient use of fertilizers and organic residues, make agriculture a significant contributor to greenhouse gas emissions [15, 17]. From the farm gate to consumers, refrigeration and other supply-chain activities are an additional major source of greenhouse gas emissions. As global demand for food, fodder and bioenergy crops grows, many agricultural systems are depleting soil fertility, biodiversity and water resources. In many regions there are large gaps between potential and actual crop yields . Every year, an estimated 12 million hectares of agricultural land, which could potentially produce 20 million tonnes of grain, are lost to land degradation, adding to the billions of hectares that are already degraded [19, 20]. Estimates indicate that one-third of food produced for human consumption is lost or wasted across the global food system . This paper reviews the critical contributions required from the scientific community in order to foster integrated, decisive policy action for addressing the interconnected challenges of food insecurity and climate change. As a global community, we need to make concurrent, strategic investments to establish climate-resilient agricultural production systems, make efficient use of resources, develop low-waste supply chains, ensure adequate nutrition and encourage healthy eating choices . This will require significant capacity for coordinated action in policy-making, private business and civil society and will not be possible without scientific and technological innovation. Farmers will need to produce significantly more food on less land, with less water, using less energy, fertilizer and pesticide without further encroaching on sensitive ecosystems . Intensification of food production must be accompanied by concerted action to reduce greenhouse gas emissions from agriculture to avoid further acceleration of climate change and to avert threats to the long-term viability of global agriculture. Climate-smart agriculture must enhance and secure the livelihoods of rural farmers. There is a large potential for reducing net food system emissions through efficiency measures in production as well as through demand management such as reduction of loss and waste in supply chains and changing food preferences [12, 24]. For example, in Kerala, India, anaerobic digestion technology has been used to recycle domestic organic waste, including food waste, to produce biogas for cooking and electricity . There is also meaningful potential for greenhouse gas sinks associated with a number of agricultural practices. Some of these practices, such as improved land management, have co-benefits for both the reliability of food production and the quality of the environment . For example, intensive rice production techniques have come into use across several regions of Viet Nam and are associated with higher yields as well as reduced use of nitrogen fertilizers and lower nitrous oxide emissions . Market demand for organic and eco-certified products, consumer expectations for social and environmental corporate responsibility and longer-term concerns about sources of supply have contributed to greater attention to sustainability by some agribusinesses . The multiple threats to food security are interconnected, and multi-scale and robust knowledge systems are critical given our increasingly globalized food system . Adaptive management and governance to improve nutritional security, economic prosperity and environmental outcomes will require a much better global system for integrating information about agriculture, ecosystem services, markets and human populations in real time. (The need for shared information in order to address global problems was recognized at the World Summit for Sustainable Development, leading to the formation of the Group on Earth Observations and the development of the Global Earth Observation System of Systems ). Existing and future investments in information and knowledge must be structured to identify limits, inform tradeoffs and deliver practical guidance for a sustainable future, not simply to maximize single components of the food system. Mechanisms should include remote-sensing and ground-based monitoring systems and spatially explicit support systems that integrate biophysical and socioeconomic information. Such an information system will give us a richer understanding of the dynamic systems we depend on and will enable us to renew and broaden our efforts to secure a more sustainable and healthy food system for our own and future generations. It will also enable measurement of progress toward target indicators such as those identified in Bangladesh’s 5-year Country Investment Plan for improved tenure of land and water resources, access to financing, private-sector involvement and empowerment of women . As a global community, we need to navigate toward a safe operating space (see Figure 2) that provides adequate food and nutrition for everyone without crossing critical environmental thresholds. At present we operate outside that safe space, as witnessed by the enormous number of people who are undernourished. If current trends in population growth, diets, crop yields and climate change continue, the world will still be outside this safe operating space in 2050. The situation then will be unsustainable and there will be very little room to maneuver. Plotting a course towards a safe operating space will require innovative technologies, institutions and policies, and will severely test our social, technological and agricultural ingenuity. There are various changes we can make to either enlarge the safe space or move ourselves into the safe space. First, the global demand for food will increase with population growth but the amount of food per person that needs to be produced can be brought down by eliminating waste in supply chains, ensuring more equitable access to food and moving to more resource-efficient (and healthier) vegetable-rich diets. Secondly, given its large land base, global agriculture represents a major opportunity for mitigating climate change and helping to moderate its overall negative effect on agricultural productivity  through a wide range of regionally suitable practices that increase the efficiency of carbon and nitrogen management (for example, livestock feeding regimes that reduce methane emissions) or sequester carbon (for example, agroforestry) . Finally, agricultural innovation, including better management of soil, water and other resources and careful matching of crops to environments, can help adapt food systems to climate change. For example, under China’s Plan for the Construction of Protective Cultivation Projects, 1.6 million severely degraded hectares of grassland have been rehabilitated  with improvements in soil structure and enhanced carbon storage . The transition to a global food system that satisfies human needs, reduces its carbon footprint, adapts to climate change and is in balance with planetary resources requires concrete and coordinated actions, implemented at scale, simultaneously and with urgency. In February 2011 the Commission on Sustainable Agriculture and Climate Change was convened to identify critical leverage points and practical policy actions to be undertaken by key stakeholders and institutions in pursuit of food security in the context of climate change. Drawing on a review of recent major assessment reports, expert consultation and their own knowledge, the Commissioners proposed seven areas for policy action to achieve food security in the face of climate change . For each of these seven recommended policy actions, we now identify relevant contributions needed from the scientific community. As a first step to inclusion of agriculture in the mainstream of international climate change policy, negotiators should establish a work program on mitigation and adaptation in agriculture under the UNFCCC. Similarly, country representatives to global policy processes should integrate sustainable, climate-friendly agriculture into ‘early action’ climate finance schemes. To enable coherent dialogue and policy action related to climate change, agriculture, crisis response and food security, at global, regional and national levels, governments and global donors should develop common platforms at global, regional and national levels. The global food system is managed through a complex mix of public and private-sector action, across local to global scales. Collectively, the policy choices within national governments, United Nations bodies, global treaties and conventions, regional economic communities, political forums (for example, G8, G20) and standard-setting bodies shape the way food is produced, distributed and consumed. The scientific evidence base is an essential foundation for public policies and programs as well as for systems of market and industry governance and of civil society influence and agenda setting. Global climate change policy is a critical arena for solidifying international support for sustainable agriculture development programs that adapt to and mitigate against climate change. National climate change action plans can also usefully integrate the agriculture sector in country-specific ways. Without a global commitment to reducing greenhouse gas emissions from all sectors, including agriculture, no amount of agricultural adaptation will be sufficient under the destabilized climate of the future . The scientific community can support evidence-based policy-making by quantifying vulnerability of agriculture to climate change and forecasting outcomes under a broad range of potential mechanisms for agricultural adaptation and mitigation. By working across disciplinary boundaries, researchers can develop a pragmatic, multi-disciplinary understanding of what it means to reduce poverty and food insecurity within the context of the planet’s boundaries. Scientists can help to mobilize increased investment by detailing how multiple benefits can be achieved through sustainable farming practices and by clarifying geographic and sectoral potential for greenhouse gas mitigation. Donor governments should implement and strengthen the G8 L’Aquila commitments to sustainable agriculture and food security and enable UNFCCC Fast Start funding, major development banks and other global finance mechanisms to prioritize sustainable agriculture programs that improve infrastructure and rehabilitate land. To reflect the significance of sustainable agriculture in economic growth, poverty reduction and long-term environmental sustainability, governments should increase national research and development budgets, build integrated scientific capacity and support revitalized extension services, technology transfer and communities of practice to increase knowledge of best practices and access to innovation. By demonstrating the outcomes of alternative farming practices in different regions, farming systems and landscapes and by clarifying the conditions under which local agricultural production systems integrate innovative technologies or approaches, researchers can help to effectively direct investments in agriculture . For example, in the Cerrado region of Brazil, public-sector investment in agricultural research combined with producer innovation has been credited with dramatic gains in productivity and livelihoods despite low natural soil fertility . To enable more productive and resilient livelihoods and ecosystems, with emphasis on closing yield gaps and improving nutrition, multi-benefit farming systems should be developed and rewarded. This includes introducing strategies for minimizing ecosystem degradation and rehabilitating degraded environments, with emphasis on community-designed programs. To empower marginalized food producers and increase crop productivity, improvements are needed in land and water rights, access to markets, finance and insurance, and local capacity . Subsidies that provide incentives for farmers to deplete water supplies or destroy native ecosystems should be modified . To prevent further loss of forests, wetlands and grasslands, the economic incentives for sustainable intensification of agriculture should be coupled with stronger governance of land tenure and land zoning . There is great variety in the pattern of agricultural productivity and land use in different regions. For example, cereal yields in Asia in 2001 were 240% higher than they were in 1961 with minimal change in land use (that is, increased production per unit land area), while in the same period in sub-Saharan Africa land use increased by 80% with only moderate increase in cereal yields . Strategic investments can make an important difference. The agricultural potential in Africa is substantial and existing technologies can be used to create the necessary transformations in increasing productivity. Through international, regional, national and local collaborations, researchers have a critical role to play in defining the practical meaning of sustainable intensification and elucidating forms of low-emissions agriculture that support long-term productivity and resilience (that is, decoupling increase in yield from emissions). There is a wide array of opportunities to investigate the suitability of sustainable agricultural practices (for example, diversified rotations, agro-ecological processes, improved nutrient and water-use efficiency, agroforestry, minimum tillage) in different regions and farming systems. To boost productivity while reducing greenhouse gas emissions, greater global coordination on research and implementation is needed . Some promising areas include improved breeding and input for crops, livestock and aquatic organisms, diversification of agricultural systems (for example, agroforestry), soil management to sequester carbon and resource-efficient practices for crop production. To promote public trust and inform debate on new advances, scientists must become adept at articulating the benefits and dangers of new technologies in an open and transparent way. To provide rapid relief when extreme weather events affect communities, funds that respond to climate shocks should be developed (for example, index-linked funds) . To moderate excessive food price fluctuations by promoting open and responsive trade systems, country information on production forecasts and stocks should be shared, and early warning systems should be established . Safety nets and other programs to help vulnerable populations become food secure can include cash and in-kind transfers, employment guarantee schemes and education. Humanitarian responses to vulnerable populations threatened by food crises should be rapidly delivered through robust emergency food reserves. Global donor programs, policies and activities should be harmonized, paying particular attention to systematically integrating climate change risk management, adaptation and mitigation co-benefits, and improved local nutritional outcomes . 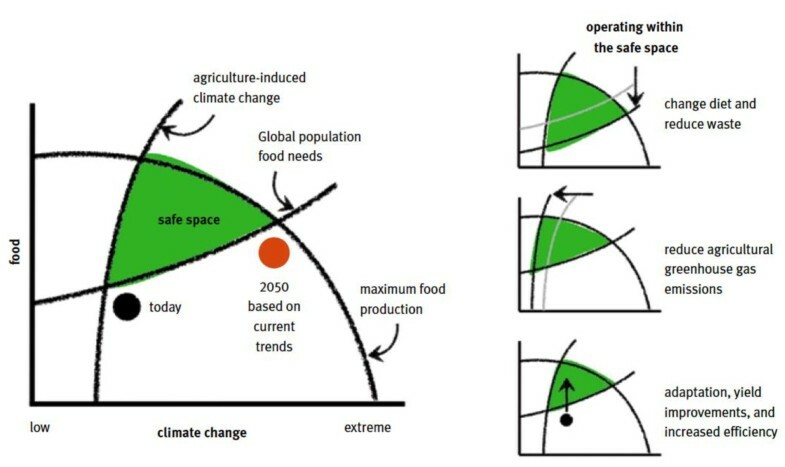 Key areas for multidisciplinary research include clarifying how index-linked funds can best reduce impacts on climate-affected populations (that is, increased hunger and poverty, lost productivity), investigating the criteria and optimal design for effective food reserves and understanding the drivers of food crises to improve targeting of fiscal responses. Research initiatives may be directed toward local-level strategies for risk management, preparedness, institutional capacity-building and household and community food systems. Chronic undernutrition and hunger should be addressed by harmonizing development policy and coordinating regional programs to improve livelihoods and access to services among food-insecure rural and urban communities. Positive changes in the variety and quantity of diets should be promoted through innovative education campaigns and through economic incentives that align the marketing practices of retailers and processors with public health and environmental goals . A coherent set of evidence-based sustainability metrics and standards should be developed to monitor and evaluate food security, nutrition, health, agricultural productivity and efficiency, resource use and environmental impacts, and food system costs and benefits. The research community can deliver better knowledge about the variety of food combinations that can deliver a nutritionally appropriate and environmentally low-impact diet. To improve overall food supply, scientists should investigate opportunities to improve agricultural productivity and resilience to climate change through effective deployment of existing and new technologies for producing, processing and distributing food. Research is needed to understand the impact and cost-effectiveness of a range of interventions on dietary behavior among different socioeconomic groups . The toolbox for promoting sustainable diets includes economic interventions (for example, taxation of specific food types), retailers’ purchasing guidelines (for example, to restrict consumer choices), public education campaigns (for example, advertising and programs in schools and workplaces) and labeling . In all sustainable agriculture development programs, research and investment components focusing on reducing waste, from production to consumption, by improving harvest and postharvest management and food storage and transport should be included. Integrated policies and programs should be developed to reduce waste in food supply chains (for example, economic innovation to enable low-income producers to store food during periods of excess supply). Dialog and working partnerships across food supply chains (producers, processors, retailers, consumers, regulators and researchers) can help to ensure that interventions to reduce waste are effective and efficient (for example, redirecting food waste to other purposes), and do not create perverse incentives. Research and innovation will be needed to improve understanding of the causes of food loss and waste and support experimentation with reduction strategies . This should include development of effective technological advancements in production, harvesting, and postharvest handling systems, drawing on expertise across plant biology, engineering, agricultural economics, food processing, nutrition, food safety and environmental conservation. Agencies and organizations that fund food systems research should prioritize work on optimizing yield, nutritional quality and postharvest life as well as characterizing the sociological dimensions of food consumption in different cultural and economic settings, including home food management, which is important for designing effective education campaigns . There is a range of opportunities for reducing consumer and food service sector waste in middle-income and high-income countries using public campaigns, advertising, taxes, regulation, purchasing guidelines and improved labeling [1, 12]. Raising awareness of food waste and promoting the use of efficiency strategies among food businesses, retailers and consumers will probably need to be targeted at specific economic and cultural characteristics . Increased, sustained investment in regular monitoring, on the ground and by public-domain remote-sensing networks, is essential to track changes in land use, food production, climate, the environment, human health and well-being worldwide. Spatially explicit data and decision-support systems that integrate biophysical and socioeconomic information and that enable policy-makers to navigate tradeoffs among agricultural intensification, nutritional security and environmental consequences should be developed, validated and implemented. To address food price volatility, improved transparency and access to information in global food markets as well as investment in interlinked information systems are needed . The threats posed by climate change to food supplies and livelihoods are likely to be spatially variable. We will need to identify global hotspots where the threats are greatest and to develop specific, practical interventions to boost resilience in these areas. We also need a more robust understanding of our dynamic and increasingly globalized food system if we are to make headway on moderating food price volatility and increasing overall efficiency of the food system. From 1961 to 2003, world food trade increased from 1,500 Gkcal/day to >7,000 Gkcal/day . There is growing integration of global supply chains and the emergence of large economies like Brazil, China and India as major sources of both demand and supply of agricultural products. In many low-income countries, rural and urban areas are ever more interconnected  although imperfect connectivity between global and domestic markets inhibits price transmission across global, national and local markets . Scientists are integral to the development of a global system of repeated observations of ecological and human systems with key roles in advancing technical capabilities for monitoring and streamlining remote-sensing data to user communities. Working with governments, researchers should engage stakeholders to design and create novel frameworks that assimilate existing information assets (for example, farmer knowledge, spatial data) and incorporate them into decision-making pathways. Multidisciplinary research effort is needed to characterize the interactive drivers of food price spikes and the effectiveness of possible interventions. Research activity is needed in a diverse set of areas to improve understanding of agriculture’s vulnerability to climate change, food price dynamics, food waste and consumption patterns and monitoring technologies as well as multidisciplinary investigation of regionally appropriate responses to climate change and food security challenges. Making these changes, although technically feasible, requires urgent, collective and substantially increased action internationally, nationally and locally. The growing threat of global climate change greatly amplifies the urgent need for food systems to shift to better meet human needs and align with planetary resources. This will demand major interventions, at local to global scales, to transform current patterns of food production, distribution and consumption. Investment, innovation and a deliberate effort to empower the world’s most vulnerable populations will be required to construct a global food system that adapts to climate change and ensures food security while minimizing greenhouse gas emissions and sustaining our natural resource base. Greatly expanded investments in sustainable agriculture, including improving the supporting infrastructure and restoring ecosystems, are an essential component of long-term economic development. The sooner these investments are made, the greater the benefits will be. The scientific community has an essential role to play in meeting the global challenge of moving the world into a safe operating space in which agriculture can meet global food needs while reducing its greenhouse gas emissions. Given the already intolerable conditions for many livelihoods and ecosystems, and the time lag between research and development and widespread application, we need to take urgent action. aNote that future Food and Agriculture Organization estimates may be revised downward due to a review of the Organization’s estimation methodology. bFor example, the 2003 Maputo Declaration on Agriculture and Food Security by African governments committed 10% of national budgets to agriculture. The work of the Commission on Sustainable Agriculture and Climate Change was funded by the CGIAR Research Program on Climate Change, Agriculture and Food Security (CCAFS) and the Global Donor Program for Rural Development (GDPRD). We express gratitude to researchers at CSIRO, INRA and the University of Minnesota whose input helped to shape the ideas presented in this manuscript. All authors read and approved the final manuscript. Through their service (in their personal capacity) on the Commission on Sustainable Agriculture and Climate Change, JB, MA, MC, AFB, MG, MJ, LE, TM, CN, RS, RS, NVB and JW developed the underlying concepts and recommendations and reviewed the manuscript. MC and CN contributed to supporting studies on food price volatility. MG contributed to supporting studies on changing diet patterns. CN reviewed background literature and drafted and edited the manuscript.